Release the two pets in the middle from their pet boxes. Try not to smash the wires of the locked blocks till you are able to see the locked blocks under the metal boxes. After that you have to activate and use the line blaster to activate the two keys in the middle of the screen, destroying the metal boxes under them. 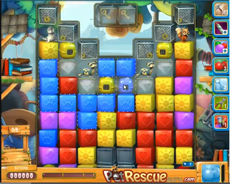 Then keep clearing the blocks of the level, using the two balloon boosters of the screen, when needed. With the 2nd activation of the line blaster destroy the last line of the screen where there are two metal boxes. In case you are stuck on Level 511 you should definitely watch our vid!